Cinquefoil is a member of the Rosaceae (rose) family, the Potentilla genus. There are many, many varieties of cinquefoil which range from a low-growing, spreading mat of weeds to bushes three feet tall used for landscaping. I’m just going to discuss the most common one found as a weed in this area, appropriately known as common cinquefoil (Potentilla simplex). 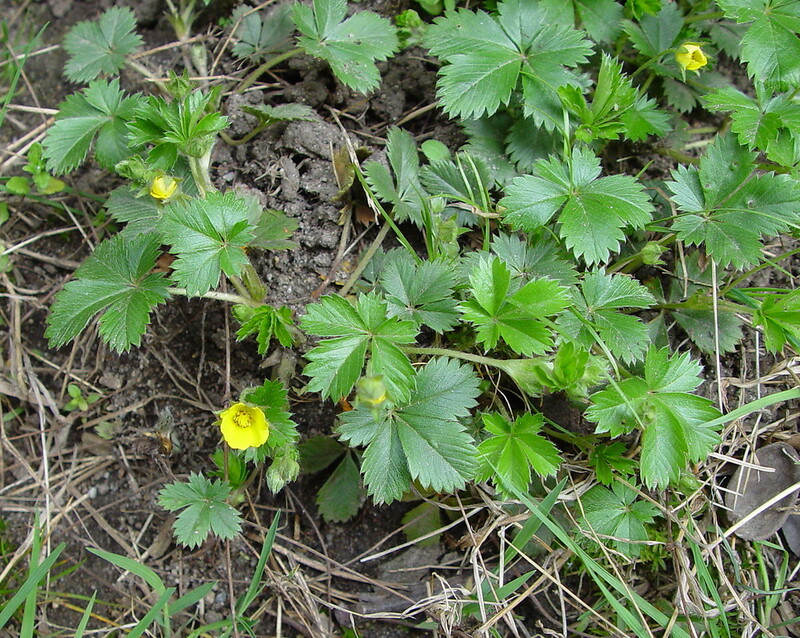 Cinquefoil has palmate leaves. That means they are shaped like a hand with fingers extended. Depending on the variety, they have three to five “fingers” on the "hand." The leaves are serrated on the edges and have blunt, rather than pointed, tips. As time goes on the plant grows taller, the leaves get longer and they look less like a strawberry plant. Eventually, they will have five-petaled, yellow flowers. The blooming period can occur from spring to mid-summer, and lasts about a month but only a few flowers will be in bloom at the same time. The flowers primarily attract small bees and flies. For some reason, the birds don't eat the seeds much, but small animals, such as rabbits, often eat the foliage. Cinquefoil grows in gardens, along roadsides, in recently cleared soil, even in gravel. It prefers partial to full sun and survives in moist to dry conditions. Like most weeds, it is an easy plant to grow. It spreads by seeds as well as by stolons or "runners," stems which grow along the surface of the soil and put down roots along nodes which grow into new plants. 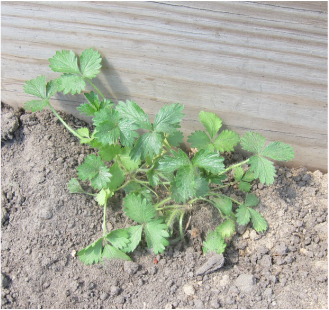 To get cinquefoil under control, pull or dig plants as they appear or they will spread quickly along the stolons and form a colony. 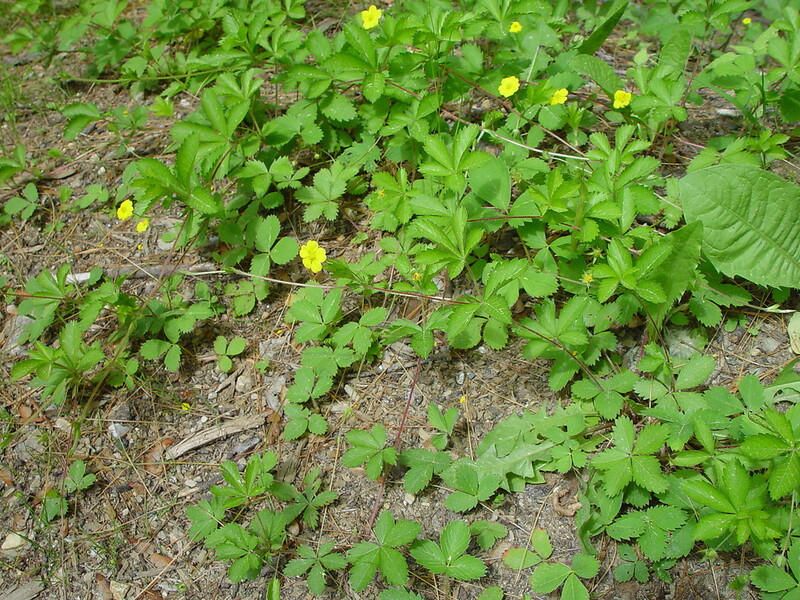 Like many weeds, cinquefoil was imported to North America from Europe because the settlers considered it a useful plant. For the Euell Gibbons fans: yes, young shoots and leaves of cinquefoil are edible in salads or cooked as a pot herb. Also, like most weeds, cinquefoil has been used medicinally in the past. Cinquefoil contains large amounts of tannins so that an infusion made from the root can be used as an astringent for cleansing and soothing the skin. It is even used as an additive in some anti-wrinkle cosmetics. To make a compress to relieve skin irritations, boil two tablespoons of chopped fresh cinquefoil leaves in a pint of water. Allow it to steep for 15 to 20 minutes, strain and cool to lukewarm. The powdered or crushed root or cinquefoil can be used to stop small cuts from bleeding by causing blood vessels to contract. 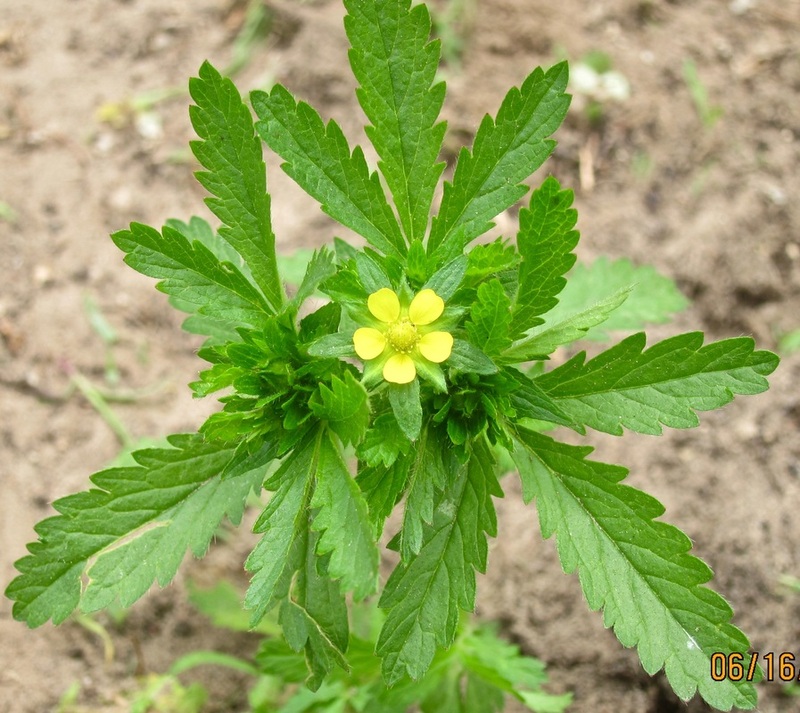 Cinquefoil is also useful and effective as a means of detoxing and has been found helpful in reducing withdrawal from addictive alkaloids like nicotine and cocaine. Since there are no side effects associated with the use of the cinquefoil, overdose or prolonged use is not an issue. Cinquefoil also has antiseptic properties and is used to make a mouthwash for thrush infections as well a gargle for periodontal disease and other gum and teeth problems. A strong decoction will inhibit infections wounds. I wouldn't suggest throwing out your antiseptics in the medicine cabinet, but when you are camping or without medical supplies for some reason, it would be better than no antiseptic. I don't endorse any switch to herbal medicines (such as the "recipe" below) unless it is an emergency but in an emergency situation it is great to be able to use common, readily available herbs. A word of caution, however: whenever gathering plants in the wild, do make certain you have correctly identified the plant. Boil the fresh plants for 5 minutes (or steep dried herbs for 15 minutes). Drink one cup of this tea before meals. Should you want to use the plant, the best time to harvest cinquefoil is in June by pulling the entire plant. Dry it in a shady area.